Founded in 1823, Birkbeck University of London is one of the world’s top research universities and part of the prestigious University of London. Birkbeck’s unique feature lies in the only specialist provider of evening higher education in London both in full-time and part-time mode of study. Such flexibility allows students to gain invaluable working experience and attend to other commitments while they study. 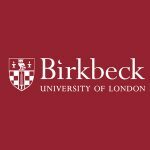 Birkbeck University of London is ranked within the top 350 worldwide and 39th in the UK according to the Times Higher Education (THE) 2018 World University Rankings. The University is rated 306th in the world in the 2019 QS World University Rankings. In 2014, the University was placed 30th in the UK for research, with 73% of its research rated ‘world leading’ or ‘internationally excellent’ in the Research Excellence Framework (REF) Exercise.